Panzer III is the common name of a medium tank that was developed in the 1930s by Germany and used extensively in World War II. The official German designation was Panzerkampfwagen III (abbreviated PzKpfw III) translating as "armoured battle vehicle". It was intended to fight other armoured fighting vehicles and serve alongside the Panzer IV. However, it soon became obsolete in this role and for most purposes was supplanted by the Panzer IV, though some Panzer IIIs would continue to be used for infantry support until late in the war.Even then older Panzer III chassis were being used for a variety of SPGs including the StuG III versions and as tank recovery vehicles, among other uses. The Panzer III ausf E/F were the first large scale production versions from1939-1940. Armed with 3.7 cm KwK 36 L/46.5 (later 5 cm KwK 38 L/42) guns. 531 produced. 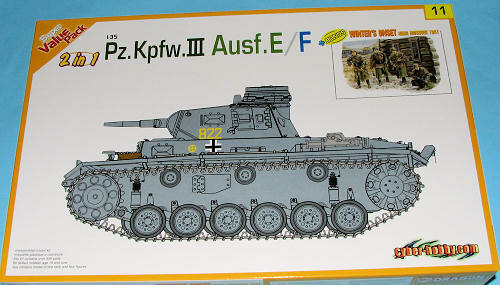 The Panzer III ausf E was one of Dragon's biggest selling kits and was highly anticipated when it was initially produced several years back. This particular boxing is part of their Value Pack series that adds some additional detail and figures to the standard kit. In this case the value added bits are brake cooling air-intake cover, smoke candle rack, magic tracks w/details on both sides. The nice thing about these tracks is that each side is a slightly different color of plastic so you won't get them on the wrong side. The bonus figure set is German Winter's Onset #6162 with the figures basically in winter garb. Instructions are the smaller set in color with 20 well drawn steps. There are notes as to what bits to remove and what holes to drill to produce this particular variant. 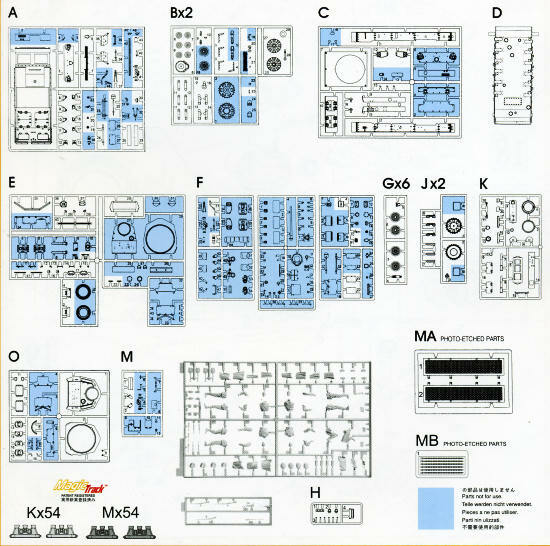 As you can see from the parts layout, you'll have quite a few spare bits. Markings are for four different tanks, all in Panzer Grey as you can see from the illustration to the right. 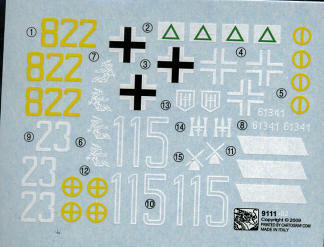 The well printed decal sheet has all the numbers and unit ID badges you'll need. Considering what you get, this kit is a real bargain. Not only an excellent armor kit, but it has the separate track links and a bevy of figures to go along with it, all at a lower price than the initial release.